When I take the time to think back over the last few months I’m reminded of how lucky we are that the road to tonsillectomy has been relatively straightforward. With no argument from our GP about a referral to ENT. I’d actually gone in ready to plead my case for Piglet, however, he suggested a referral before I even had to ask for one. The registrar at the ENT appointment was understanding as to why she was there and needed her tonsils removed. 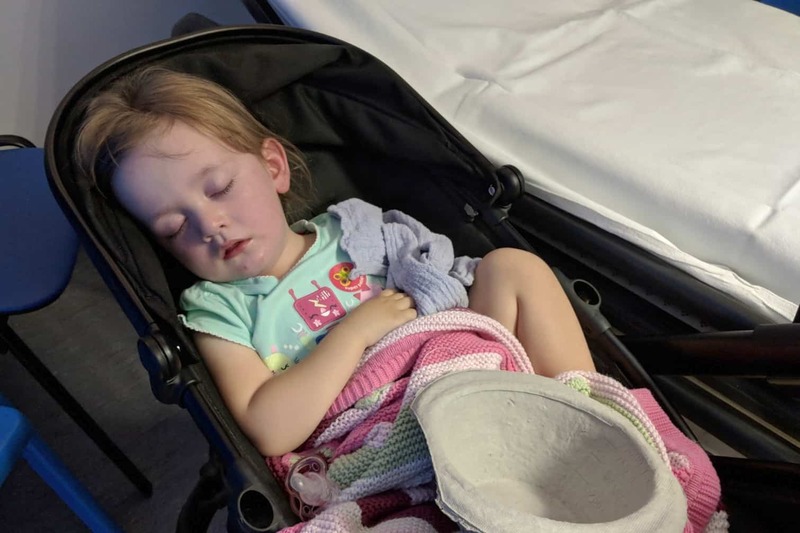 With an urgent request put through to the powers that be – although attending the appointment with another case of tonsillitis certainly helped me prove how much she suffers. With an operation date arranged for less than two months since seeing ENT. So you can forgive me for being a little foolish in thinking that we were on the home stretch. Thursday we had a few extra sneezes from Piglet. She always sneezes with such dramatic effect that it is easy to remember them. Friday brought even more, however, I dismissed it as a cold. It appears that piglet doesn’t do colds or at least just a cold. An unsettled night was followed by an hour or two of her perking up enough to play. Shortly followed by a slump. Falling asleep on the sofa whilst watching her favourite film, The Greatest Showman. It’s then that an all too familiar pattern started to emerge. Her temperature creeping up and her breathing starting to change. As I watched her sleep, I kept an eye on her chest and could see her breathing becoming more difficult for her. A call to the 111 service to see if I could get an out of hours appointment rather than heading down to the walk-in centre in the city. They were concerned about her breathing, advising me that a clinician or paramedic would call me back within 30 minutes. Or if they had not been able to call me they would arrange for an ambulance. I prepped a bag in anticipation and waited for the call. After 45 minutes I called back to say that I had transport and could take her to A&E myself and not to waste an ambulance resource. I’d already called Mr Boo at work who made his way home to look after Roo and Tigger whilst I took Piglet to hospital. With A&E reception transferring us straight through to Children’s A&E for triage. Where she had observations taken and advise us that we needed to wait to see a doctor – which took two hours. Which as you can imagine meant that she was in a worse state than when we arrived. 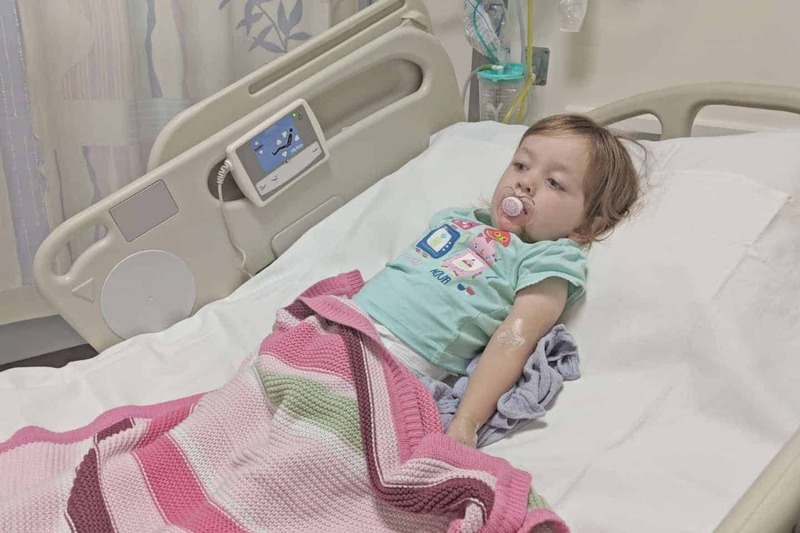 After an assessment by a doctor, it was found that she had grade 4 tonsillitis, croup and on the verge of dehydration. Plan of action was to start pain medications and sort out antibiotics. However, despite me explaining about the 13 previous doses of antibiotics she’s had in the last 12 months, plus two hospital admissions they didn’t listen. I refused the antibiotics that the nurse came back to administer (Penicillin V) to which the junior doctor was not happy about. She tried to explain the rationale behind her decision to prescribe this antibiotic rather the one she usually takes. To which I explained that Piglet vomits when taking Penicillin V, she’s already very poorly and would end up dehydrated on top of everything else. I left it with ‘if you really insist on giving her Penicillin V then do it via IV‘. I knew that they wouldn’t do this for two reasons. Firstly, they would need to admit her for the IV’s and secondly the second-line antibiotic Clarithromycin that she normally has would work out cheaper. Cue a nurse coming through with a dose 10 minutes later. A transfer over to the Children’s Assessment Unit and magic cream applied in case bloods were needed. Another doctor assessed her and asked about the chest x-ray that A&E had wanted, but I knew nothing about it. So she decided not to bother and prescribed her some steroids, antibiotics (the correct ones!) and a throat spray. With her temperature coming down, it looked likely that we would be going home soon. However, her heart rate was still very high (180-200) so we had to stay for additional monitoring before they’d let us go home. Thankfully, Piglet had begun to perk up as we left – proving that children really do bounce back. I’m hoping that this is the last bout of tonsillitis that we have with Piglet. We’re on the home stretch for her operation, so fingers crossed!